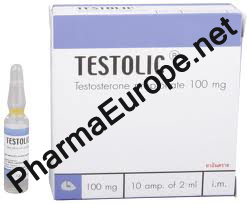 Testosterone Propionate is fast acting as effects begin in only one day. Benefits include muscle mass increases, stength increase, increased training aggressiveness, faster post-training recovery, and low water retention. Although there is a high rate of aromatization, it does not cause gyno as often as other testosterone esters. 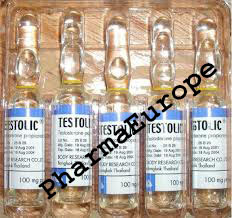 This is an esterified form of the base steroid testosterone, much like enanthate, cypionate and sustanon 250. It's a superlipophillic, oil-based injectable that slows the release of the steroid into the blood stream. Compared to enanthate and cypionate, propionate is a very short ester and is released quite fast. That meanss injections are needed more frequently. Levels will peak after 24-36 hours and begin tapering from there on out, making the longest possible time-span between injections about 3 days. Most athletes will opt to inject 50-100 mg every day to every other day. As we said before, results are seen very fast. Frequent injections can be painful, to a point where users will begin scouting for different locations to stick the needle. Testosterone enanthate and cypionate are long-acting esters. They require some skill with ancillary drugs and familiarity with post-cycle protocol since simple discontinuation will not put a halt to all problems. In that aspect, for those who do not master ancillaries and post-cycle therapy, propionate is perhaps a better product to star. Levels of androgens and estrogens will drop within 2-4 days of discontinuation, effectively halting or reducing any occurring side-effects. 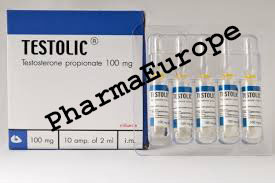 Nonetheless, this is still a very potent testosterone with a risk of side-effects (the characteristics of testosterone do not change despite the ester, which is just a carrier) so the use of Nolvadex, Proviron, or Arimidex is highly advised. What is of note with propionate, is that users have successfully incorporated it into cutting cycles as well. Especially people who tend to lose a lot of mass normally during extreme diet phases find this useful. By injecting every two or three days and using only 50-75 mg each time, no notable water builds up (or at least none that can't be fixed with proviron, arimidex or winstrol) and no fat is deposited, allowing a user to stay relatively lean. 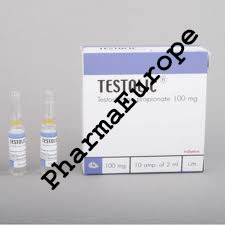 So this type of testosterone can be used to keep gaining or retaining mass until 2-3 weeks out of contest time with relatively little difficulty. Its best use is in bulking phases to pack on mass. It is popularly stacked with Deca or Dianabol for awesome gains. It is also stacked with Anavar for cutting cycles. See our stack and cycle section. You may know that ampoules are preferred by many because they are almost never counterfeit. You always get the real deal with us!